Is this a blog post about potatoes or is it really about the merits (or not) of decoration in contemporary art? That question sounds intriguing but maybe it just demonstrates the power of the humble potato! You only have to say the word ‘potatoes’ in our house and someone will respond with, “What’s Taters?”, a line from Lord of the Rings which was immortalised in this classic little Albino Blacksheep animation . I have a love of art galleries and museums and for me visiting them is akin to dipping your hand into a deep bran tub of treasures; you just don’t know what you will pull out. You may have visited for a museum for a specific reason but while there you are guaranteed to stumble across other unexpected delights. Back in October 2011 I visited Brighton Museum and Art Gallery. It had been more than ten years since my last visit but I did remember that they had a good collection of furniture design classics which I fancied seeing again. However it has been this ceramic potato that has haunted me for these past few months (see photo above). I really did a double take when I first saw it; it looked like a potato and yes the label confirms that it is in fact a ceramic stirrup cup in the shape of a potato. I know that fruit and vegetables have inspired ceramic artists for years but this is a potato not something pretty like a pineapple! I mean are the eyes on the surface of this potato decorative... they do say ‘beauty is in the eye of the beholder’! Over the past months questions around this potato’s beauty and decoration have lurked in my mind. 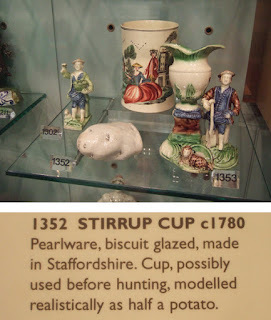 Of course there are the other questions too; I have wondered if there is any link at all between the choice of decoration and the function of this 18th century stirrup cup. It could be that its owner’s spirit of choice was Poitín (made from fermented potatoes) or maybe the potter just had a sense of humour and a bit of a thing about potatoes? You can spend too much time pondering over such things. There is an ongoing debate about the role of Decoration in Contemporary Art and you can watch this ICA video What is the Use of Ornament in Contemporary Art and Architecture? for more on that. A fair chunk of the debate revolves around architecture but if you want the most entertainment fast forward to 25 minutes in when Grayson Perry speaks. Grayson and I have something big in common we both believe in the power of stories; we both believe that humans thrive on stories and actually need them to keep us sane. In his presentation Grayson points out that decoration is used to tell stories so in fact decoration is actually providing a much needed function; decoration is adding to our wellbeing and keeping us sane. I am a fan of his playful approach and humour. Playfulness doesn’t mean that a piece of art is lightweight, no far from it. I would say that we need an element of playfulness to lighten the heavy load of life. Playfulness and humour give us a lift and remind us of all the fun that there is to be had. I will shortly be exhibiting in At Play 2012. Boris is one the six Frillip Moolog beings included in this 3 venue project. 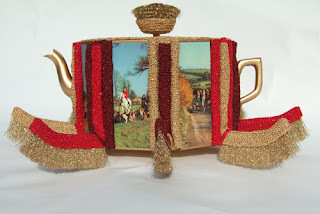 Although I like detail (some would say decoration) I am not drawn to ‘fussy’ and patterned fabrics or materials. Boris is one of the exceptions as a major component of this strange little being is the vintage Win-el-Ware table mats. Why do I have several sets of these mats, is their appeal the kitschness of the (decorative) images? What is kitsch? (Watch the complete ICA video to hear Charles Jenks thoughts on kitsch and postmodernism). For me I think that the strongest appeal of these mats is because of the stories that they tell. They obviously remind me of a time when a visit to your grandma would mean a tea table laid with them (remember High-Tea). Their small size reminds us how items of food have all got so much bigger now (except WagonWheel biscuits). Their images tell stories; I mean fox hunting images on polite table mats, that would be unheard of now! 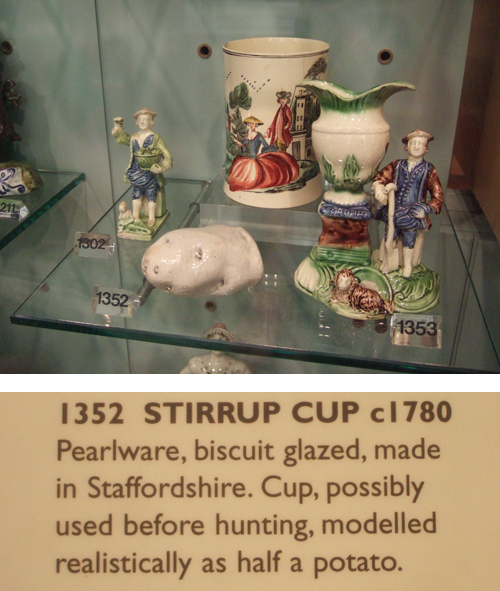 Of course the potato above is labelled as being a stirrup cup so maybe a good swig of something strong at the beginning of the hunt and then a nice cup of tea at end? I have been saving these food themed Win-el-Ware mats for the right occasion. But they lead me to thoughts of perfect hostesses and chiffon negliges. Take a mythogeographical detour and have a peek at my (very entertaining) cookery book Celebrity Cooking: dishes chosen by the famous. 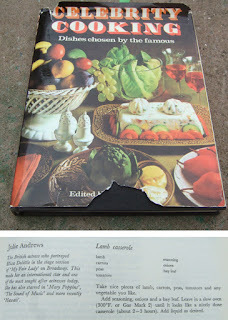 It was a whole different world back in 1967 when the secret ingredient in Meat Loaf Exotique’s was a banana and Julie Andrew’s very basic recipe was upgraded from stew to casserole. Grayson Perry’s selected slides for his contribution to the What is the Use of Ornament in Contemporary Art and Architecture? debate at the ICA are eclectic. They range from gothic churches and castles in Bavaria to a couple of his own pots and also include a photo of some decorative tiles ("looking like a poor man’s Guernica") outside a butcher’s shop in France. Yes eclectic that appeals to me; I enjoy taking inspiration from all around me. I too have a nice photo of tiles in a Spanish doorway but for an extra special tiling job you have to make a special visit to the public toilets in Chichester. Now what story was this workman telling us; was he homesick for his farm childhood or was he just bored stiff? I see a freethinking artist breaking loose from the shackles of council regulations.